When a review for Real Life Press (http://RealLifePress.com) and a digital download book by Heidi St. John titled The Busy Homeschool Mom’s Guide to Daylight came available for Old Schoolhouse Magazine’s Review Crew, I was so hoping I’d get to participate, and I was thrilled to be chosen for this review. I (can I even say desperately?) needed to hear what this dear mother of seven had to say. I’ve been drowning this year. I have four students and a fifth who desperately wants to join them. I have two more littles. It’s been hard. My house has suffered, my attitude often stinks, and supper often has been thrown together at the last minute, decided upon based on what I can cook with whatever meat I found in the freezer and, if I was lucky, thawed out that day – or could cook from a frozen state. Confession: I’ve meal planned maybe six weeks total in my life. Those times were when I had masses of company coming and a brief two week stint that I attempted to change my ways. It clearly didn’t stick. About a week before I got my digital download, I was talking with my sister in law about meal planning. I needed to commit to this, I know. 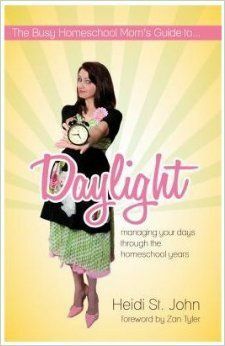 Then, I read The Busy Homeschool Mom’s Guide to Daylight. Guess what she suggests? Yep. Then I got to chapter seven, Wasted Daylight. Ouch. She hit home like few can. It felt like she had watched my mornings and she had a few words to say. I sit down to the computer to check on something. Two hours later, I look around, realize no one has done what I’ve instructed, breakfast is strewn across the kitchen, I’m unshowered, and I’m angry that life has stopped as far as morning routines because I was attempting to accomplish a few things with email, blog, reviews, etc. And then Facebook. Just ouch. I can’t recommend this title enough. I’ve named some of the points that hit home with me most, but the whole thing was entirely needed. It was pointed and funny and hit entirely close to home. My life looks so much like some of the tales St. John described, it was almost funny. I’ve never read anything by Heidi St. John before, but I’ll be watching for her other titles to be sure. She’s speaking at a homeschool conference I’m planning to attend soon, and I have each of her seminars on my must-attend list. I forwarded the file to my Kindle to read. It worked great. A print copy is also available, if that’s your preference. The digital download is an .epub and is $10 available here while the print copy is $12.95 and available here. 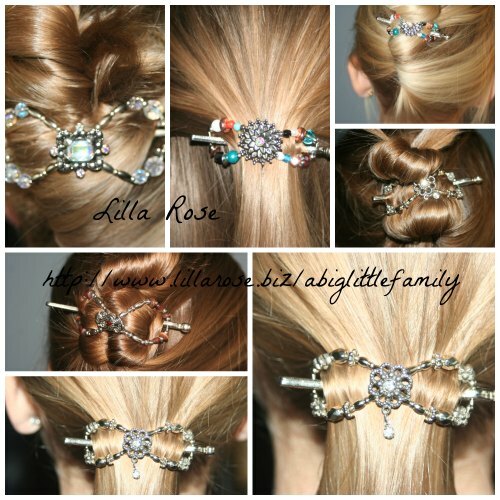 Heidi St. John is on Twitter, Pinterest, and Facebook. To read what the rest of the crew thought of this title as well as several other publications from Real Life Press, check out the Review Crew Blog.